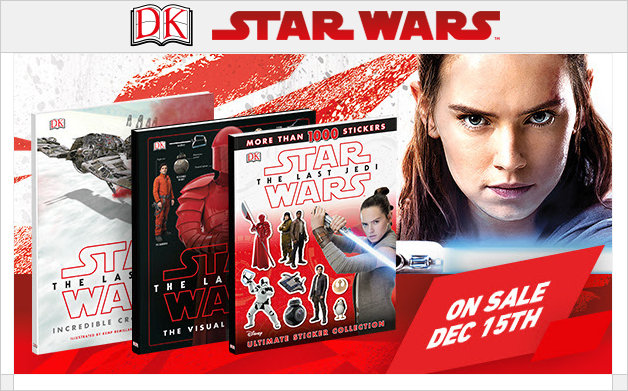 DK Books has four new releases today for The Last Jedi. Click here to check them out. Star Wars: The Last Jedi: The Visual Dictionary is the definitive guide to Star Wars: The Last Jedi, revealing the characters, creatures, droids, locations, and technology from the new film. Packed with 100+ images and information as penned by Star Wars scribe Pablo Hidalgo, it’s a must-have for all fans who want to go beyond the movie experience. This beautiful hardcover book reveals the inner workings of 13 key vehicles from Episode VIII of the Star Wars saga, Star Wars: The Last Jedi. Each vehicle is shown as an intricately detailed, full-color cross-section artwork, complete with callouts to the important features of each ship. Clear, comprehensive text makes this an indispensable reference guide for the new craft in the Star Wars galaxy. Follow the exciting adventures of Rey, Finn, and Rose in the highly anticipated new film, Star Wars: The Last Jedi! This 48-page book is aimed at helping young readers develop their reading skills, and will introduce them to brand new heroes, villains, vehicles, and locations, as well as featuring children’s much-loved favorite characters.